I'm a Halloween fan. Not of decorating, not of candy, but of costumes. Oh, how I love dressing up for Halloween. We normally have a church function on or near Halloween that we dress up for, but this year I had three events to attend. I couldn't just go as the same thing to each one, so I used makeup to make my costumes unique. First was the couples' party. 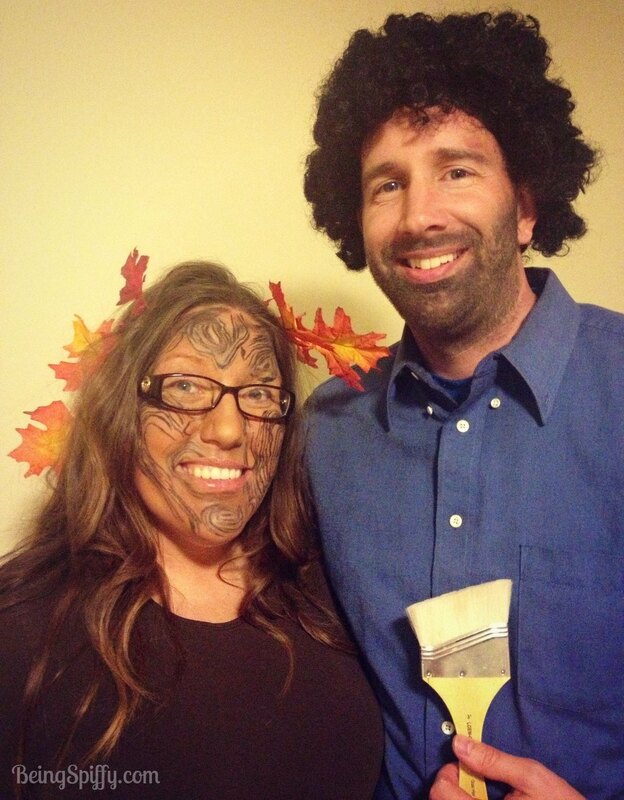 We went as Bob Ross and his happy little tree! Here's my normally blond husband with his afro wig and me with my a-ma-zing makeup done by Alison at the MAC counter. A few people knew what we were right off the bat. Others needed some 'splaining. Next was Bunco. I wasn't about to be a tree without Bob (let alone do that crazy makeup myself), so I dressed up as a comic book drawing. I was supposed to have red dots all over my face a la Lichtenstein, but I ran out of time. Alas. Finally, for our church chili dinner and trunk or treat, I intended to go as a flapper. I ended up looking more like a black and white silent film star. The kiddos at the party were stumped as to what I was supposed to be. One insisted I was a punk rocker. Not sure how many punk rockers wear pleated skirts and heels, but hey, whatever works!